A new arcade game for your Atari 2600! Hi! Thanks for your interested. Your project looks cool! Feel free to host any of my freeware homebrews games on your project! A link back to their original itch.io page on the readme file would be appreciated if possible. Regarding license, all my games hosted on itch.io are freeware but still copyrighted, unless otherwise noted. Good luck with your project, and thanks for helping people getting aware of retro homebrews releases! Woaw, thanks a lot for your support! Today is the 30th birthday the SEGA Genesis / Megadrive console! 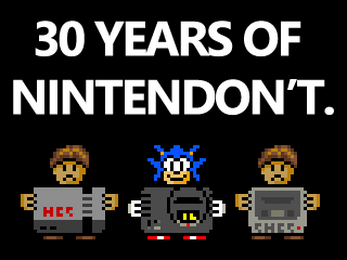 To celebrate it, here is a new Genesis / Megadrive game titled "30 Years of Nintendon't". Woaw, 177% that's impressive! I think that's the current record. Even after loads of thorough testing, my current personal record is 145% (and I know every answer by heart!). Thanks for your suggestion though - to be honest, I wasn't expecting many players to reach the 100% threshold, or get over it! Hi thanks a lot for your support, it's very appreciated! As I said, the game is very unbalanced for now (1 hour is very short!). To pass the 4th egg, you have to catch them a bit latter (i.e. make the egg touch the legs of the chicken), so they will go less higher, and reach the basket. My current record is 6 eggs :). But don't worry, I'll try to work more on the game to have a more balanced gameplay, as in it's current state it's way too challenging! Oustanding demake, congrats! I'm a big fan of the original game, so I'm in familiar ground playing your version. You managed to capture the soul of Spelunky in very few pixels, congrats! TIC-80 community · Posted in SOLVED: Change Startup Path? Thanks a lot for this topic, I had the same issue (wanted to use TIC-80 in portable mode on a USB key too), and I found the solution thanks to you! I've discovered TIC-80 a few weeks ago and I'm having a blast with it :). As with any virtual console, the ultimate dream would be to be able to play it on an actual console or something like that. I've tried the Android version, and it's very cool to be able to play your own games "on the go.". However, I think there is an issue with the virtual buttons placement. In portrait mode, the game display goes on top and the virtual buttons go on the lowest part of the mobile screen, which is perfect. However, when playing in landscape mode, the display screen in vertically centered, and the virtual button are placed over the display screen, also vertically centered. I think it would have been better to have the display screen centered on top of the screen, and the virtual buttons on the bottom of the screen instead (like in portrait mode). That way, when you have a mobile phone whose height is greater than TIC-80 display area height, you can see the full display and have the button not covering it. Also, It feels more natural to tap virtual buttons on the lower part of the screen instead of the middle of it IMHO. So I don't know if there is a technical reason in the difference between the way portrait / landscape mode are vertically centered on mobile, but in my opinion it would work best if both orientation would use the "vertical centering" way of the portrait mode. - Press F11 if you want to play in FullScreen. My game lacks a bit in the audio and graphics area, but I tried to focus on the gameplay due to the limited time. There are 10 levels in total! 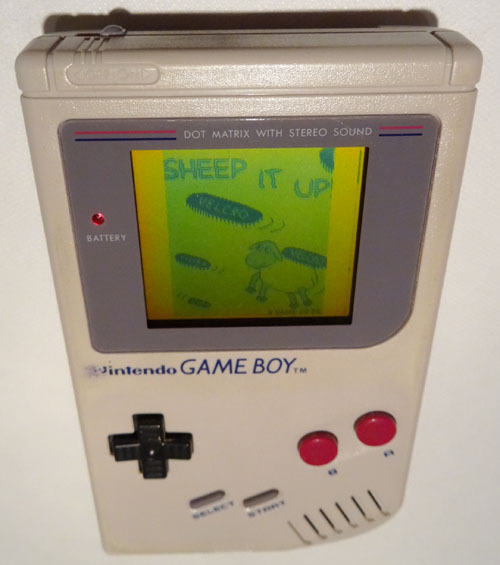 itch.io Community » Game Development » Release Announcements · Created a new topic Sheep It Up! - A new arcade game for your Game Boy! 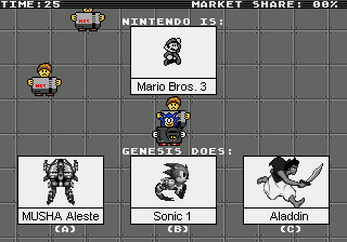 You can also download the ROM file of the game here, and use it with your favorite emulator. 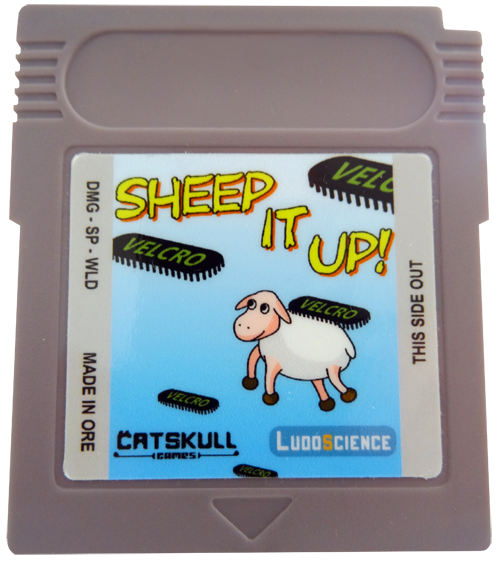 Last but not least, if you want to play it on an actual Game Boy, you can buy a Sheep It Up! cartridge for a mere 15$ (+shipping). The game cartridges are made with newly manufactured parts, and are assembled by hand! Here is a picture of the game running on my (quite beaten up) original Game Boy I had as a kid! I hope you'll enjoy the game, your feedback is welcome as it's my first Game Boy game. Nice entry, the graphics are really well done, congrats!